The agenda of the Forum started with opening dinner and welcome addresses by Andreas von Beckerath. In his inspiring speech the Ambassador of Sweden in Ukraine underlined that Sweden is ready to support Ukraine in all its endeavors. Cooperation between the two countries — the Ambassador noted — is very important for further development of both parties. Ukraine and Sweden have a long history of cooperation. Sweden is among top 10 countries by the volume of investments to Ukrainian economy. Last year they were up to $ 25 million. Solemn ceremony continued by Ruslana Lyzhychko — a famous Ukrainian singer, the winner of Eurovision contest 2004. She said a few kind words about the readiness of Sweden to support Ukraine, then she sang the national anthem of Ukraine in two languages ​​— Ukrainian and Swedish. After that the stage welcomed the Minister of Foreign Affairs of Sweden Carl Bildt. “Ukraine has recently faced a lot of challenges,” he noted. “However, new times come and open new opportunities, which must be taken”. The opening ceremony of the Forum was also visited by the second President of Ukraine Leonid Kuchma and Andriy Parubiy, the Secretary of the National Security and Defense Council of Ukraine. 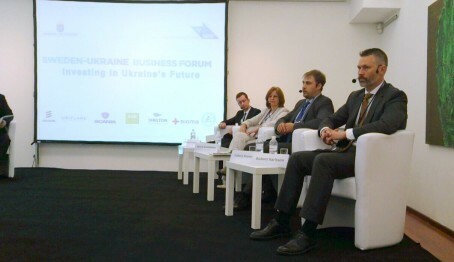 The press-conference with Ukraine and Sweden state representatives opened the second day of the Forum and was followed by Forum`s partners presentation. Sigma Ukraine company — the largest Swedish company working in Ukraine in the area of software development — was among the forum senior partners and was presented by Valery Krasovsky, Sigma Ukraine`s COO. The Forum continued with working sessions. The first was keynoted by Pavlo Sheremeta, the Minister of Economics Development and Trade expressed the confidence that Ukraine is very attractive for investing. “We are constantly working to attract more countries to invest in the Ukrainian economy. We are actively fighting against corruption, which, unfortunately, remains a big problem in Ukraine. We have a program of actions aimed to enhance Ukraine`s attractiveness and we are ready to implement it,” Pavlo Sheremeta said. The panelists agreed that economics reformation will be possible when the government will attract investments by creating transparent conditions of doing business in Ukraine. “To make investments Ukraine`s national project the government had to be changed. That is what happened. The new government has a strong political will to bring changes to the economy. Our ambitious goal is to bring Ukraine in top 10 countries by ease of doing business,” Serhiy Yevtushenko, the Head of State Agency for Investment and National Projects of Ukraine. Serhyi Kvit, the Minister of Education and Science of Ukraine became a keynote speaker of the stream devoted to the ICT technologies role in cross-sector upgrade. Over the last years Ukraine has become known as the largest IT hub of the Central and Eastern Europe. The Ukrainian IT industry and its export segment show active development; year by year the number of specialists employed in the industry increases, the growth goes up to 50% per year, according the experts` opinion. IT industry is growing faster than traditional industries, gaining 30-40% per year even in the period of economic crisis, bringing new work places, forming positive image of Ukraine, building cooperation with other countries. For years Ukrainian IT industry developed without any support from the government. However to keep its leading position and continue growth it required attention from State bodies. 4 years ago the representatives of Ukrainian IT business together with European Business Associations and IT Committee, acting within its frameworks, initiated the process of establishing a dialogue with the government to create favorable conditions for the industry development. Forum program ended with the Concert of Symphony Orchestra of Ukraine National Philarmony led by a Swedish conductor Maestro Niklas Willén, symbolizing how productive the cooperation between two countries can be.